Humans are distinct as a species for having both the ability and the tendency to label certain actions and things as “good” or “bad” and “right” or “wrong.” In addition, we often make statements of necessity or obligation, arguing that one “ought” or “should” behave in a certain way. What are the implications of such propositions and why do humans make them? When I say something is “wrong,” do I mean that it is incorrect in some objective, factual sense, or do I mean that it is undesirable and violates an assumed preference? When I say that one “ought” to do something, what is the basis for the necessity? Typically, “moral behavior” is characterized as pro-social, altruistic, and non-violent (or only defensively violent), whereas “immoral behavior” is characterized as anti-social, selfish, and violently aggressive. Why have we come to conceive of morality in this way and how might we justify it? The theory I advance here is what I have termed “Normative Ethical Subjectivism.” As a naturalist I reject any metaphysical or non-empirical grounds for an ethical theory. Many argue that this causes an impasse, since they claim that empiricism cannot account for value statements. However, I think this depends on how we frame and conceive of morality. To approach the issue I adopt a Goal Theory approach to ethics. Humans are not impartial, disinterested subjects but are beings with needs and preferences. Moreover, humans are a social species of shared “normative” goals, which we obtain as a community. Goals are most efficiently reached not through impulse, but through careful reflection and strategy. The moral life is the strategic approach to best achieving one’s ethical objectives. I argue that since our goals as a species are normative, they provide a common basis for us to evaluate and agree upon moral propositions. Self-interest, far from encouraging immoral behavior, when applied rationally is actually the foundation for the pro-social and altruistic behavior that we typically label as “moral.” Ultimately, I offer a teleological approach to ethics, where morals serve as means to the end of happiness and self-actualization. If one conceives of morality as something other than this, then I happily elect to be amoral under such alien conceptions and see no clash in the debate. In order to lay out my ethical theory, I will first need to specify what I mean by certain key terms. The definitions I provide may not be shared by all and some will no doubt view these terms differently. However, for the sake of this discourse, I ask that one understand the terms as I have provided them in order to understand how they relate to my ethical theory. You are more than free to see these terms differently in another context, but there will be confusion about what I mean, if you do not follow the terms as I have laid them out here. Objectivism: A prevalent term brought up in moral debates is the question of whether morality is “objective.” This term often leads to confusion, since “objective” can mean a variety of things, such as “impartial” or “factual” or “true regardless of opinion.” I find all of these descriptions to be unhelpful, and so I will provide my own instead. When I say that something is “objective,” I mean that it exists outside the mind of a personal subject and is externally substantive. For example, gravity is objective, since gravity would exist regardless of any observer. However, beauty is not objective, since beauty is dependent on the perception of a subject. I do not find morality to be “objective” for the following reasons: 1) Impersonal natural forces do not exhibit moral affinities. If they did, why not expect hurricanes to curve around cities or fire to burn away from people? Instead, nature functions like a cold, indifferent machine, harming the good and bad alike. 2) The only things that do exhibit moral affinities are sentient beings, which suggests that morality is a conception of the mind, but not some external property of the universe. Subjectivism: Often times “subjective” is stigmatized by the notion that it means arbitrary or unfactual. However, this is misleading. Beauty is subjective but that doesn’t mean that there are no principles or patterns governing aesthetics. Rather, subjective, as I use it here, means that something is cognitive and exists solely within the mind. Subjective things can only be said to exist when a personal observer conceives of them. Morality in my theory is “subjective,” because it exists solely as concept of human thought. However, this hardly implies that it is random nor does it entail by definition that it would even be relative. As we will see, subjective things can be normative, insomuch as every personal subject would conceive of them the same, which can provide a basis for making truth claims about them. Ethics vs. Morals: Before moving further, I wish to distinguish here between “ethics” and “morals.” These terms are sometimes used interchangeably, and are often given different meanings in different discourses. For the sake of this discourse, I will define ethics as trans-situational goals that serve as guiding principles and standards for evaluating what is desirable. Morals are the strategic means by which one meets an ethic. However, this does not mean that all ethics independently exist apart from each other. In fact, ethics follow a regress where higher ethics determine derivative ones. For example, the ethic of promoting human safety is dependent upon the ethic of valuing human life. I will argue below that the ultimate ethic, to which all other ethics regress, is personal self-actualization, which is the common ethic towards which all of humanity strives. This ethic exists alone per se and is the fundamental “is” governing all “ought” statements. Ethical Realism: In ethical discourse the term “realism” is often used to describe whether a moral theory claims that moral propositions are factually true or false. This term is often confusing, however, since it is unclear in what sense the proposition is true or false. Is it true in the sense that it describes an external property of nature or in the sense that it describes a cognitive goal and efficient means for achieving it? Due to this ambiguity, I will mostly exclude the term “ethical realism” from this discourse. Nevertheless, if by ethical realism one means that a moral does factually obtain an ethical goal, then my theory arguably promotes ethical realism. Normative Ethics: To explain how my theory of ethical subjectivism does not make morality random or arbitrary, I will argue that ethics can be “normative.” That is, ethical goals can be biologically and psychologically shared among humans to such an extent that all people, when fully informed of themselves, would have a common ethic upon which to base their morals. Given a common criterion, an action can be said to be right or wrong based on whether it promotes or violates a normative ethic. In this way, humans can make moral propositions about good and bad behavior that refer to no external property of the universe, but still bears implications of factual truth, insomuch that they do or do not abide by a common goal. For identifying a common set of ethics, normative to all human beings, I shall adopt Maslow’s Hierarchy of Needs as an illustrative model. 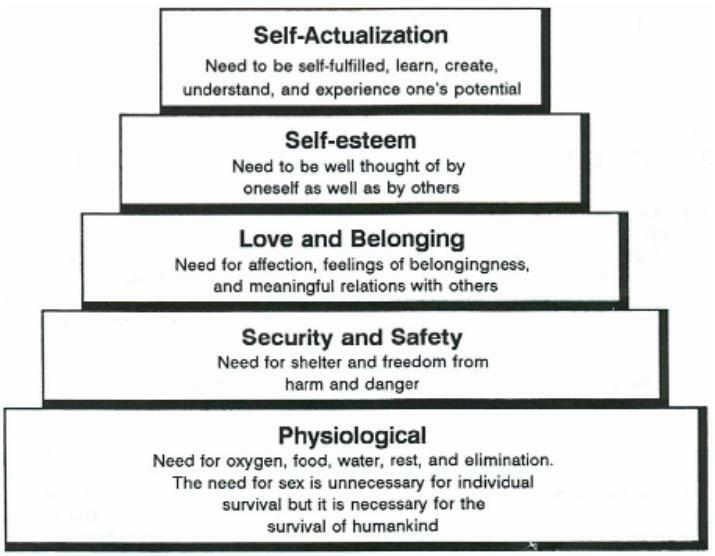 Maslow observed that human behavior can be reduced to actions meant to serve certain psychological and biological needs. Furthermore, these needs follow a regress from lower to higher needs, where a human first seeks to obtain physiological survival, but later seeks such goals as social acceptance and love. The highest goal is self-actualization, which is the psychological fulfillment and harmony of a person’s needs. Maslow’s hierarchy provides a useful basis of common goals shared among humans that can serve as a set of criteria for evaluating whether certain actions are right or wrong in fulfilling these needs. In other words, the hierarchy provides a set of normative ethics upon which all morals are derivative and upon which all moral propositions can be evaluated. Given the framework I have provided thus far, it can be said that morals serve as “means to an end,” where ethics are the ends and the ultimate end is our self-actualization as human beings. Since then morals serve as strategies for achieving ethical goals, it would be helpful and descriptive to categorize it under a “Goal Theory” teleological approach to ethics. The philosophical inspirators for my approach range from Aristotle and Epicurus to Bentham and Mill to Richard Carrier, from whom I have adapted the term. As the common motive for achieving self-actualization, I assert that all humans have an inherent self-interest. Humans are not impartial subjects, but rather goal-seeking beings who have certain preferences. However, simply because we all have self-interest does not mean that we all act according to “rational self-interest.” Humans often act on impulse or poor decision-making and commit immoral behavior that actually works against their goals. The moral life, in my theory, is one that employs critical reflection and rational deliberation in order to guide one’s behavior towards actions that actually serves one’s ethics. Given the terms as I have defined them above, each person has an immediate interest in living a moral life. We all have ethics, which serve as the goals of our behavior. These ethics are both normative and psychologically and biologically ingrained within us. Each person has a natural interest in providing for his or her basic biological needs, finding security, maintaining good social standing, promoting emotional esteem, and ultimately achieving self-actualization. When a person lives morally, they do not recklessly indulge in appetite, but instead maintain an integrity that allows them to strategically meet their needs with a higher probability of success. For example, I could indulge in my lower, short-term desires to eat and drink excessively, but this would violate my higher, long-term goals of health and well-being. The moral life of integrity must be one of critical reflection, where a person deliberates on the long-term consequences of their actions and considers whether they do or do not provide for the things that they actually desire in life. Trade: The first and foremost foundation for any society is the economic benefit obtained through a division of labor. Humans are capable of producing far more wealth as a group than they are as individuals. Since our hierarchy of needs requires economic goods to provide for them, any individual following his or her rational self-interest has immediate grounds for desiring a society, since society provides for a more productive, opulent, and wealthy society that accommodates both individual and normative goals. Security: Society next provides for a better guarantee of security. In a state of nature, no force of law or communal code protects one from the violence of another. The fruit of one’s labor can be stolen without the recourse of justice, and a life lived in mutual animosity very quickly becomes nasty brutish and short. However, society provides a basis for establishing a code of behavior and means of enforcing that code, which allows humans to have greater security as a society than as individuals. Some social systems, of course, achieve this better than others, but this does not change the fact that any rationally self-interested person has an immediate interest in a society, based on the probability of heightened security. Insurance: I have pointed out that society provides a greater economic benefit than solitude. However, occasionally I receive the objection that this provides no grounds for being altruistic towards those who are economically inefficient, due to such circumstances as being crippled. However, nothing could be further from the truth. In fact, it follows completely from rational self-interest to protect and provide for those who are disadvantaged. This is due to the fact that providing for such services establish a form of social insurance. By helping and promoting the aid of those who are less fortunate, I have a heightened certainty that if I should fall into misfortune that the same insurance will cover me. I take care of the sick and elderly today knowing that by establishing such a system that I can have the expectation of being cared for when I am sick and elderly. Therefore, such forms of altruism are actually in complete accord with rational self-interest. Self-Image: Through behaving in a pro-social manner, I will gradually receive greater trust, respect, and cooperation from those around me. A socially moral person draws others towards him or her, whereas a socially immoral person repulses them. It follows that if one desires the benefits of social interactions, they will meet it more through socially moral behavior. However, an important objection can be raised here that it may be to one’s benefit to only appear moral, but in fact to operate by an immoral lifestyle. Freeloaders are the embodiment of this behavior, who seek to disguise their immoral behavior in order to parasite off of the benefits of society. Plato perhaps took this concept to its extreme application with his thought experiment about the Ring of Gyges. Gyges had a ring that made him invisible so that he could commit any crime without being caught as the culprit. In effect, Plato removed self-image as a motive for moral behavior. Below I will provide further grounds for behaving in a pro-social manner that transcend self-image. Risk Management: It may be possible that one can conceal anti-social behavior for a time and freeload off of society. But I run a risk by choosing to do so. Since such behavior is destructive to others, I must live in constant fear of being caught and facing retaliation. Whereas, if I behave in a pro-social manner I can live with the reassurance that even if all of my actions were visible and made known to the public that they would have no reasonable grounds for retaliating against me. However, the anti-social life must always remain in the shadows seeking to disguise its true nature, running the risk each day that full exposure and resulting destructing come upon it. Compassion: So far I may have created the illusion that rational self-interest only operates for a callous, material benefit, with compassion never serving as a motivation. However, this could not be further from the truth. In fact, humans are a social species who are emotionally dependent upon each other. By behaving in a social manner, I will have more genuine friendships and lasting life relationships that serve my rational self-interest for emotional well-being. In contrast, if I am anti-social I will create only shallow relationships, become incapable of true compassion, and ultimately be left in despair and loneliness. In fact, compassion can reveal how certain actions, such as moral suicide, which would seem to defy self-interest, are actually in accord with rational self-interest. By sacrificing myself for another, I am trading a life of mere survival that includes the regretted loss of a loved one for the higher value of compassion without which life would not be worth living. Sacrifice can at times be the highest form of rational self-interest, since it can serve as the pursuit of one’s higher goals over lower goals when the two are brought into conflict. Self-restraint: Ultimately by living with integrity, reciprocating towards others, and embracing compassion, I will achieve a far more disciplined life than merely acting on violent impulses. Another common misconception is that the tyrant’s life is the most self-serving, but this once more is not true. The tyrant engages in his or her lower appetites, lashing out on impulse, and ultimately lacking any peace-bringing integrity. A tyrant’s life is in fact the most miserable, plunging into a downward cycle of anti-social behavior, making it harder and harder to restrain one’s lusts, and ultimately shaping an irredeemable character where one has learned no capacity to serve one’s higher ethics. Above I have provided grounds for why it serves one’s rational self-interest to live morally within a society. However, the objection can still be raised that this only justifies pro-social behavior towards one’s immediate neighbors. After all, I benefit from those in my own community, but what about those across the globe? What about those in enemy nations? Does rational self-interest only provide for selective tribalism? The truth is that most of human history has been a series of frequently brutal tribal conflicts. However, this was severely changed during the 20th century, which brought about two major changes: the capacity for mutually assured destruction through advanced weapons and the capacity for mutually beneficial trade through globalization. The series of increasingly bloody conflicts in the 20thcentury revealed that it was mutually beneficial for all nations to seek international means of maintaining peace. In fact, World War III, which could have been the most destructive conflict in human history and even a full apocalypse, was prevented largely due to the threat of mutually assured destruction. Furthermore, with increased means of global trade, almost the whole world is now one extended community. When one can profit from peacefully interaction with those across the globe and only suffer through open conflict, the result is that humanism best serves rational self-interest. Tribalism is a thing of the past, suited to an era where violent conflicts could gain temporary plunders, but now in the face of conventional weapons and global trade benefits, humanism is the only rational and desirable course for the future. We enjoy the benefit of living in what is perhaps the first generation in history of a humanist global community. People today are more moral and self-actualized than any other period of history, and the future will likely be better. Above I have outlined my theory of Normative Ethical Subjectivism. My theory explains how morality does not need to be rooted in some external property of the universe to still provide significant and accurate propositions about our goals. Ethics and morals are inherently subjective, as they depend upon a personal observer with preferences and rational self-interest. However, far from detracting from the importance of morality, it in fact makes morals far more relevant, since they serve as means to the end of our self-actualization. Ethics can further be normative with the result that we will all have a common basis for evaluating moral propositions. It is true that moral relativism can still exist with this structure, but it will largely diminish as experience teaches us more and more about what actions more efficiently satisfy our desires. What we find from a teleological approach to ethics is that most of the civil, pro-social and altruistic behavior that we commonly label as “good” and “moral” in fact serves a rational utility towards achieving our individual and social goals. The moral life is one of critical reflection and integrity. Through serving a common ethic, humans can obtain trade, security, and insurance. It is true that a person can freeload off the benefits of society if they project a misleading self-image, but even this will deny them the compassion and restraint necessary for a self-actualized life, and there will always be the risk of being exposed. At this point, it could still be argued that this only explains morality within groups but not between groups. After all, even gangs have internal moral codes, but why value all human beings? However, the economic achievements made possible through globalization, as well as the horrendous and undesirable consequences of modern warfare, reveal how universal human rights and thus Secular Humanism is the optimal and only fulfillment of the NES Goal Theory approach to morality. One objection that could still be raised, however, is that I actually have not provided a basis for morality at all, but merely a strategy for serving self-interest. It would depend, however, on how one conceives of morality. If one defines morality as something that serves its own end that we have a “duty” to abide by even if it makes us ultimately unhappy, then perhaps rational self-interest would serve no point. Nevertheless, in my ethical perspective, this would be the height of any conceivable evil, since morality will have been turned upside down from a means to an end of serving humans to making humans a mere means for satisfying what is “moral.” What is even more nightmarish is the thought of placing some divine being at the head of such a despairing moral system, where we serve as mere objects of his pleasures and lust, commanded to obey any moral law that he whims, even if doomed to receive no personal gain from it. Job is the perfect example of this warped an alien view of morality, the man who sacrificed everything for the sake of what was “moral” without any rational expectation to benefit from it. I can vigorously say that I would not only be an amoralist in Job’s situation, but would gladly elect to be an immoralist under such a despairing, irrational, and worthless moral code.